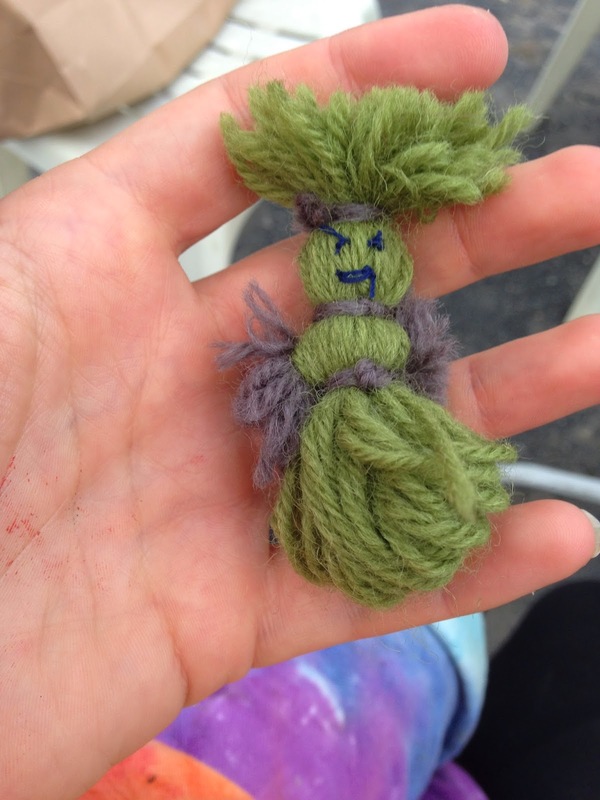 Earlier this month, I tried my hand at making a Hugelkultur. Basically, a Hugelkultur is a pile of logs/sticks/mulch/etc, covered in dirt and planted out. Here is the wiki description of the process. 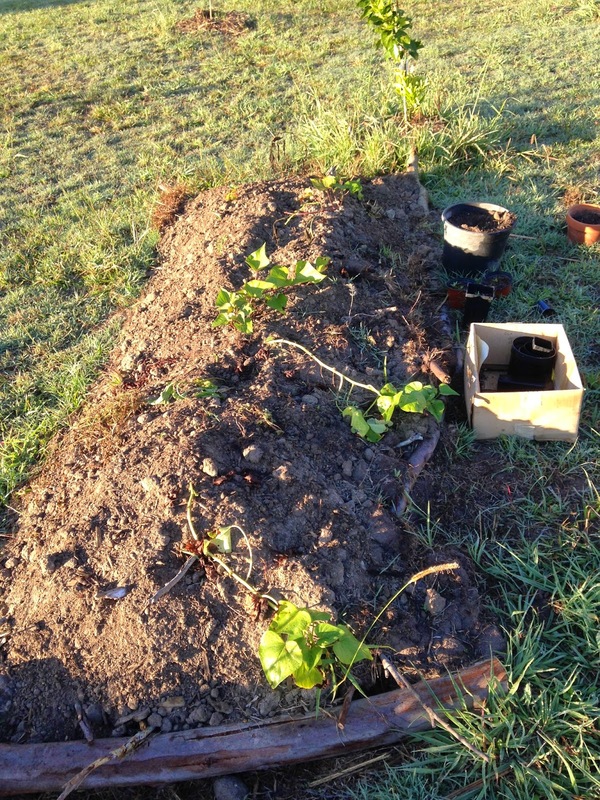 After 'construction', I watered the soil of the Hugelkultur and left the dirt to settle into the gaps in the wood. Turns out that after about a week, the Hugelkultur was about half the original height after settling. I planted it out with a variety of edibles that were given to me as cuttings from my friends mum. As mentioned in my previous article, I'm not entirely sure what most of the plants are. Some of the ones I recognise are Sweet Potato, Strawberry, Herb Robert, Comfrey and Nasturtium. 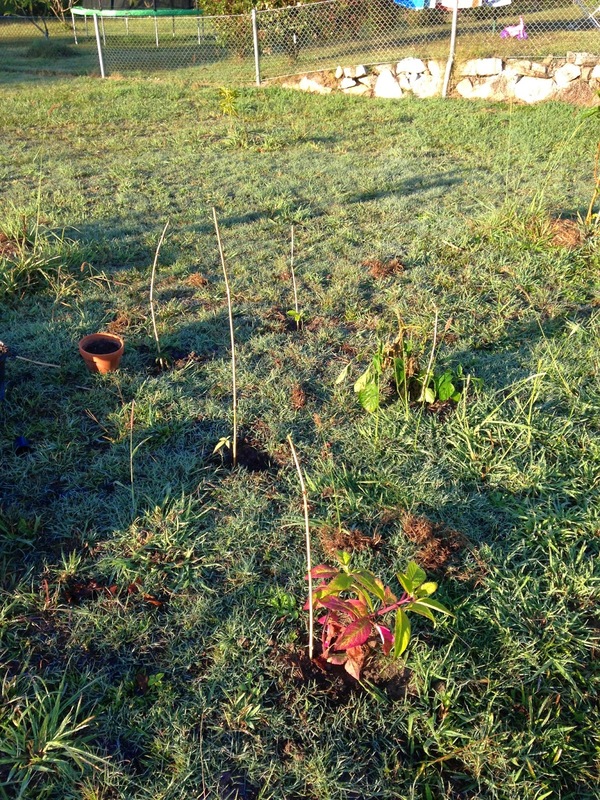 I was also given a few small tree off-cuts from my friends mum and transplanted a Capsicum bush from my parents house that wasn't doing so well there. Again, I've forgotten what the small trees are, I just know that they are all edible. This weekend I'll be mulching around these trees and also mulching the hugelkultur. 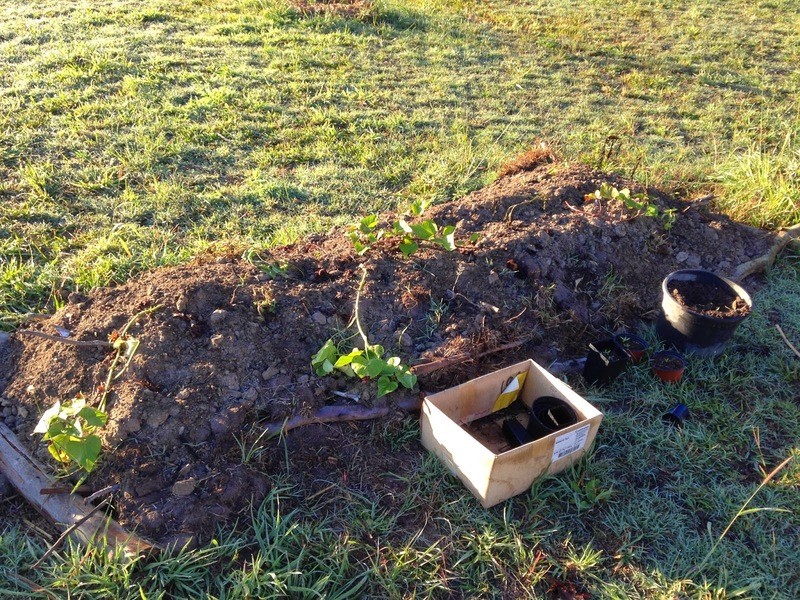 The Hulgelkultur and the small trees are planted in the middle of my Fruit Tree Orchid. Its my attempt at a food forest. Over the next few years the fruit trees should grow to about 3-5m to form the canopy layer, whilst the smaller edible trees will form the mid layer. I'm hoping to have a few hugelkulturs spread around the forest floor, planted out with ground covers and then the ground level mulched, so I don't have to mow or weed. 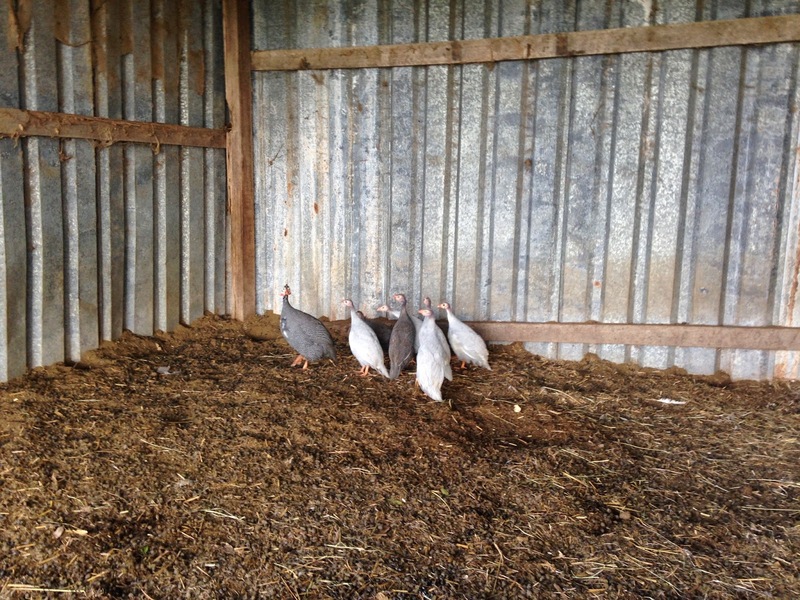 I purchased some Guinea Fowl a few weeks ago and released them to free-range about a fortnight ago. They are settling in nicely and haven't flown away (yet). So far they have been hanging around the goat shed, which is where I feed them and has water available. Unfortunately, one of the Fowls died approximately one week after being let loose to free-range. I'm still not sure why. One morning it was fine, the next it was lethargic, huddling in the corner and that afternoon it was dead. The rest seem fine, so I'm totally baffled at what happened. I'm left with seven Guinea Fowl, which seem happy to wander around the goat yard and are slowly increasing their range everyday. The six youngest ones are growing quickly and have almost caught up in size with the largest one, which was from an earlier brood. The goats were curious of their new paddock mates at first, but now largely ignore them. 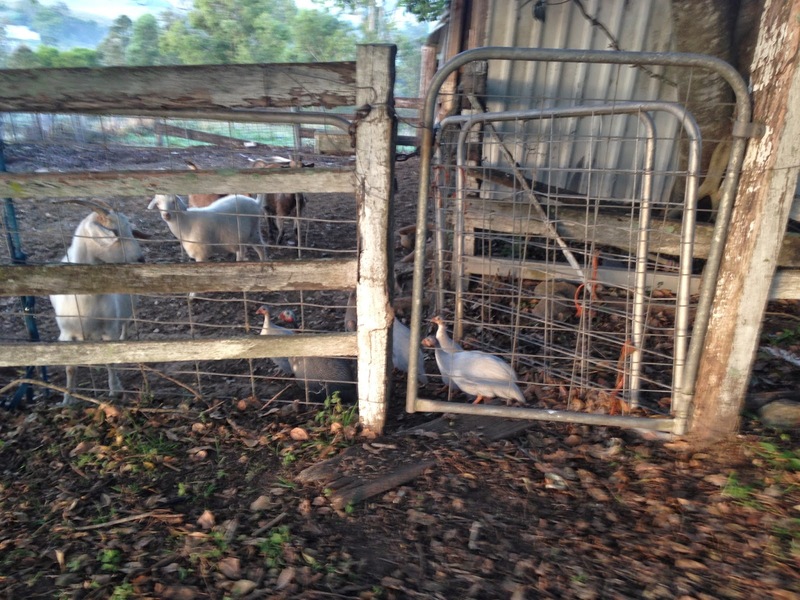 The Guinea Fowl seem a little wary of the goats, staying out of their way, but are not alarmed by them. I have discovered that the goats love the Guinea Fowl seed, so now I have to lock them out of the yard so the Guinea Fowls can eat in peace. 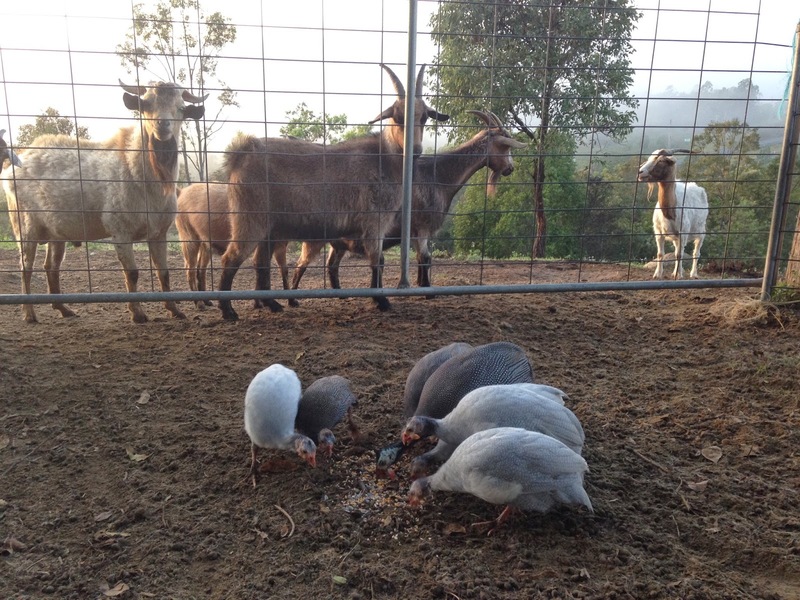 I feel like every morning when I feed the Guinea Fowl, the goats are looking on, coveting the seed. 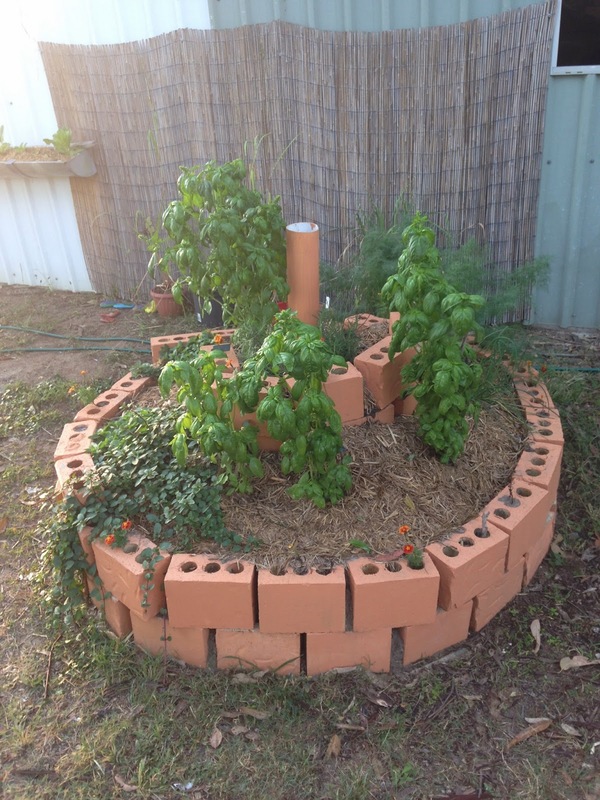 Back in March, I made a Herb Spiral for my Mum's 50th Birthday (yes, I have very young parents). It is absolutely roaring ahead. When I first planted the basil, a couple died back and I was too lazy to pull them out. Then, with all the rain in April, they bounced back to life and there is a plethora of Basil available. I've managed to make two batches of pesto with enough leaves on the bushes for many more. So I'll have to have a pesto making day on the weekend and freeze some. Lots of basil with a mint cascade. The mint and dill have also taken off. I have an exciting idea for the mint, which I will post about when I get to it. As for the dill, I'm not entirely sure what to do with it, as I've never grown it successfully before. So I'll be looking for recipes involving dill. Lately, I have been ready a lot about Hugelkulturs, so I thought I'd try making my own. If (like me two weeks ago) you've never heard of a Hugelkultur, its basically a raised garden bed. 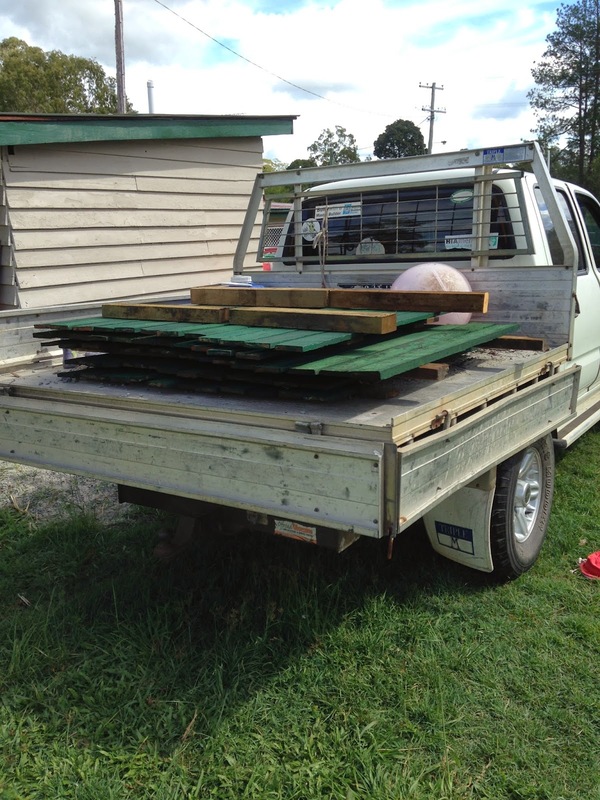 I have made a few raised garden beds, mainly at my parents farm and let me say, they are hard work and can be expensive (unless you take the Frugal Option). A Hugelkultur is neither expensive, nor difficult to built. All you have to do is gather a pile of sticks and logs, pile dirt over the top and hey presto, instant raised garden. Admittedly they look a little messy, so if you are all about perfect-looking garden, they probably aren't for you. 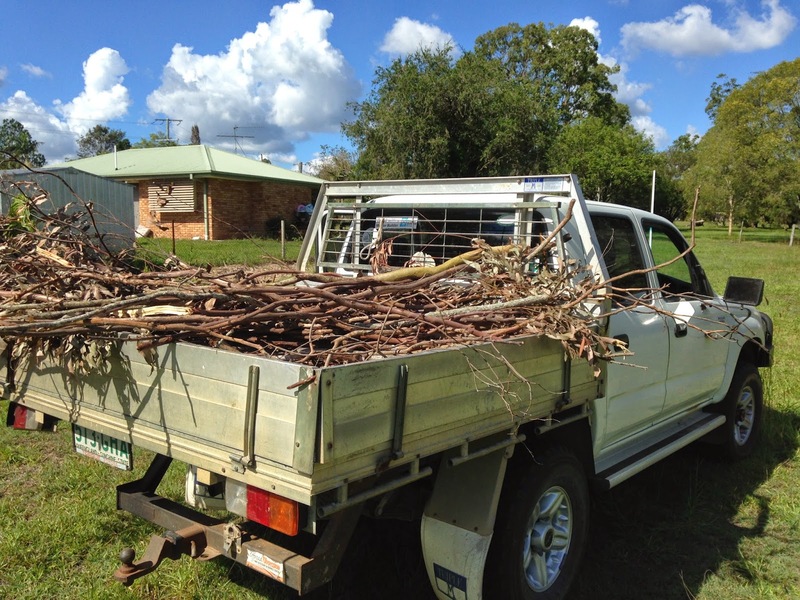 Since my block is completed bare, except for the tubestock natives I've planted, I collected a ute load of sticks and small logs from some my parents farm. Luckily for me, my dad had also done some pruning a few weeks ago, so there were a few fairly substantial tree branches. I marked out where I wanted the Hugelkultur and dug out the top layer of soil. Digging out the top layer is not essential, by any means. 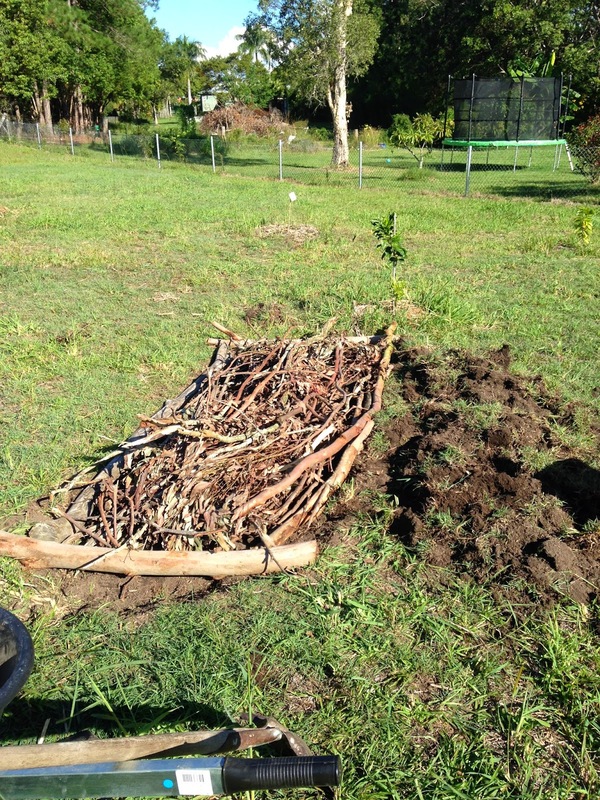 If you have poor soil, or don't want to dig, simply lay some newspaper or cardboard on the ground and pile the sticks/logs on top. 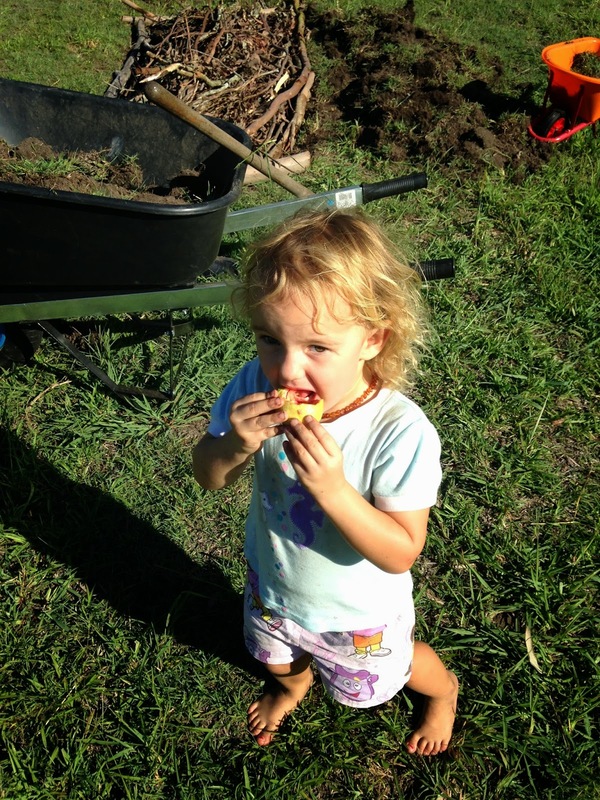 However, the soil at my block is good quality and I wanted to use it on the top layer of the Hugelkultur. I piled the soil to the side for later to spread on top. Next I picked out the biggest logs to make the border, to keep the smaller sticks in place. 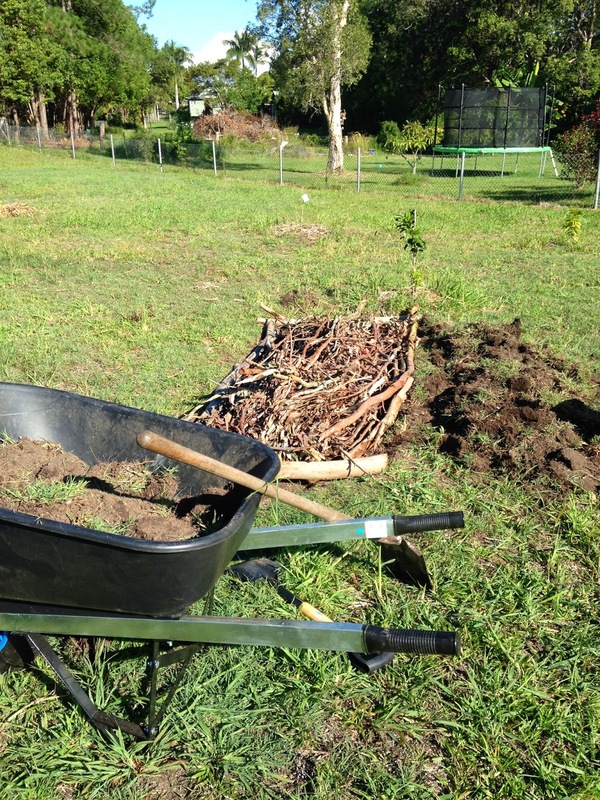 Then I piled all the stick on, covered with some soil, then covered with the topsoil. 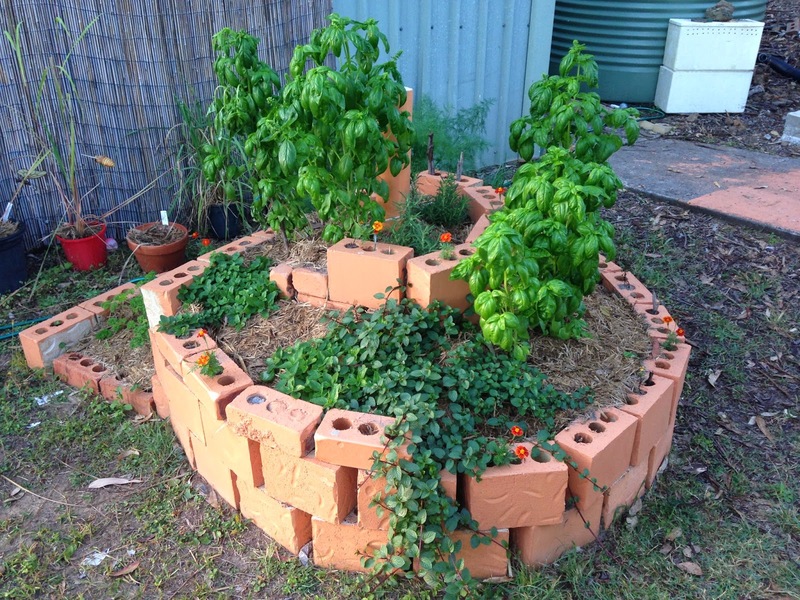 Instant garden. home grown from one of two trees on the block. I've planted out the Hugelkultur with cuttings I got from my friends Mum. They are all food producing plants, most of which I've forgotten the name of, so I'll have to have her over for a coffee and tell me what they are again. I'll do an update shortly to re-cap what I'm actually growing. The other activity I've been slowly slugging away at, is fence painting. Gigi has been such a good helperand we're almost done. I'm thinking it might only take another two week-ends and we'll have everything painted. Three weeks ago I purchased some Guinea Fowl. As mentioned in previous posts, I have a number of goats at my parents property. Nineteen to be exact. I've also mentioned that my parents live in a rural area with lots of wildlife. Some of this wildlife, namely wallabies and bandicoots, are carriers of a variety of ticks. In previous years I've lost goats, particularly baby goats to ticks. Until now, I've put dog tick collars on all the goats. This is both expensive and not ideal due to the chemicals. I had been doing a lot of reading about alternative pest control options and discovered that Guinea Fowl apparently do a fantastic job at controlling ticks. So after consulting Dr Google regarding their needs and care, I decided to look around to purchase some. Happily the next day in our local paper, someone was advertising Guinea Fowl Keats for $10 each. I called them on a Saturday afternoon and on a Sunday, three weekends ago, Gigi and I were on our way to pick up our new pest controllers. They are LOUD so do not keep them near the house, if you'd like to sleep. It is best to keep them locked up close to where you would like them to roost or free range. Even though they are 'domesticated' they are not tame or pets. Guinea Fowl can fly. Quite well. With this in mind, I set up a temporary cage for the Guinea Fowl in the goat shed. As per Guinea Fowl facts above, I placed them here because it is in the goat paddock, where I would like the Fowls to free range when it came time to let them out and there is also a lovely Moreton Bay Fig Tree next to the goat shed, which i thought would be perfect for them to roost in. Temporary Guinea Fowl confinement cage. 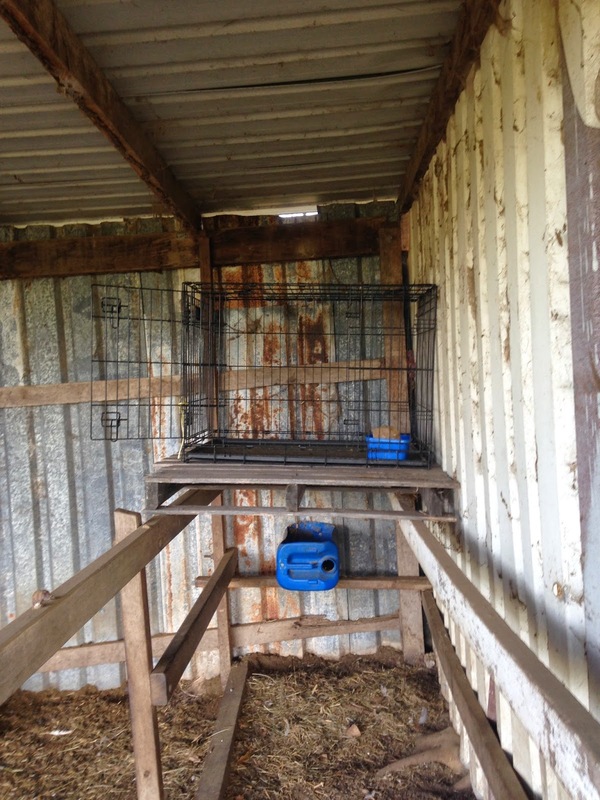 Inside the goat shed, I re-purposed a pallet as a shelf and placed the cage on top, with straw on the bottom. The cage is usually used to house newborn bottle-fed baby goats in the garage at night. Its actually a dog crate. I got the Guinea Fowl home in a cardboard box and transferred them one by one into the cage. I left them for a while to settle, then put food and water in with them. The food is a seed/grain mix that I purchased from the Produce, good for chickens, guinea fowl and turkeys. The week just gone was week three of the Guineas confinement period and therefore time to let them out. On Friday, around lunchtime, I opened the cage door, tied it back and waited for them to launch themselves into freedom. They just stood there looking at the open door. Ten minutes later, they still hadn't made a move, I got bored and left them to it. On dusk, I went back to see if they'd come back to their cage to roost. No Guinea Fowls in sight. I grabbed a torch and looked in every tree around the goat shed. No Guinea Fowls. Thinking they'd flown off, I cursed the Guinea Fowl and my own stupidity. 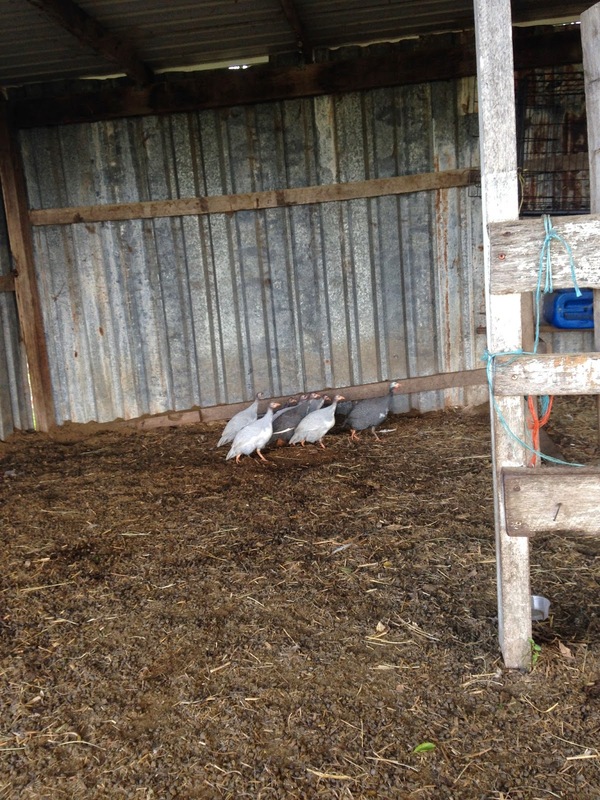 The next morning I went out to check the goats and to my surprise the Guinea Fowl were hanging around the goat shed! They hadn't made for the hills after all! They've now been free for four days are are still happily hanging around. Free ranging pest control ready to roll. They didn't run-off after all! They are wild. When I fed them and gave them fresh water every day, I softly called to them to get them used to me. For the first week, they went crazy in the cage trying to get away from me. By week three they'd stopped going crazy but still huddled in the furthest corner. If they were chickens, they would have been eating out of my hands by three weeks. Even though I'd picked a nice tree for them to roost in and placed their confinement cage next to it, Guinea Fowls have a mind of their own and have chosen a different tree to roost in at night. I still haven't figured out which tree it is. They really can fly. And run. They are very fast runners. Once they've been let out, thats it. They are now 'wild-domesticated' animals. I can see that I'll never be able to catch them or cage them again. I have no idea how to tell the difference between male and female. Currently they all look the same (except one, which is significantly older and more mature) and they are all making the same cheeping noise, which I guess is because they are still young. I have no idea how I will find their eggs to eat, when they get old enough to lay. My parents live on property approximately 10 minutes from my cottage in a nice rural area. They have lived on the same property for approximately 25 years and is it where I grew up. Most of my childhood animals still live there, such as my goats, my horses and my cat. Not only is it beautiful where they live, but they are also surrounded by wildlife. Living with wildlife isn't without its challenges. For instance, my mums vege gardens are either quite high raised garden beds, or surrounding by fencing to prevent wallabies from having a munch. So far nothing protects the vegetable garden from possums. In summer, their mango's are individually wrapped in plastic bags as protection from rainbow lorikeets and flying foxes (fruit bats). 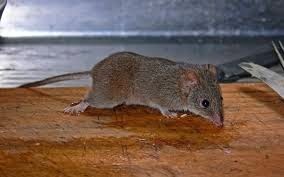 The other animal they seem to have a lot of, particularly in recent years as the cat is old and no longer capable of hunting is bush rats/mice and antechinus, which are a type of small insectivorous marsupial ranging in size up to a large rat. There is currently one living in my parents house, which they've had no luck hunting. There are also a number out by the goat shed, where we feed the goats kitchen scraps and grain. With small mice-like creatures, comes animals which like to eat said small, mice-like creatures. Namely, snakes. 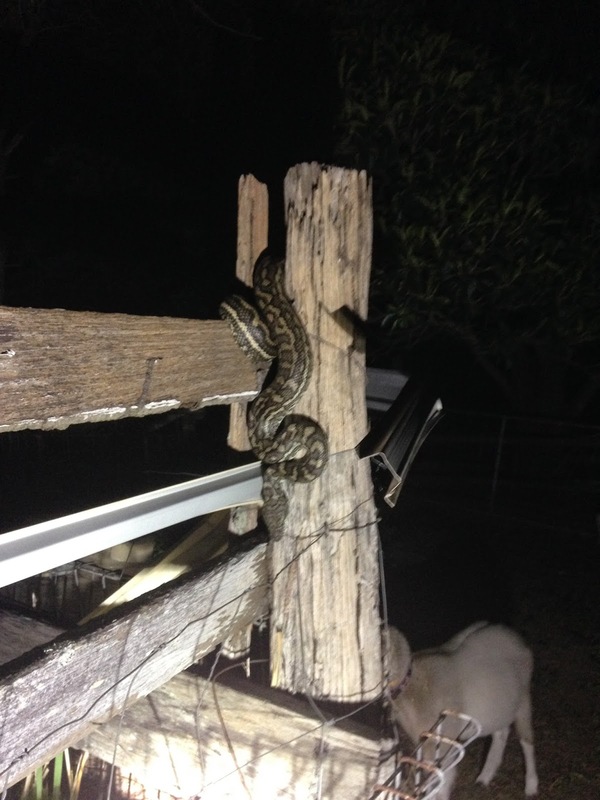 Last night when I was checking on and feeding my baby goats, this big girl was hanging about looking for a quick feed. This is a carpet python, harmless and extremely beautiful. Additionally, this year alone, there were two green tree snakes in my parents house. One was quite small, maybe 30-40cm and disappeared into the bush/garden pretty quickly. 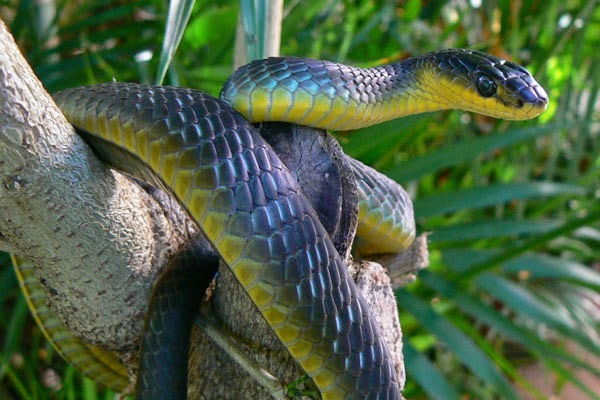 The one, which was in the office was huge for a green tree snake, between 1-1.2m. I chased it out of the house with a mop (stupid yes) into the front garden and it now lives in the garage roof. At the other end of the house is a large Silky Oak tree, with branches over the roof of the back deck. 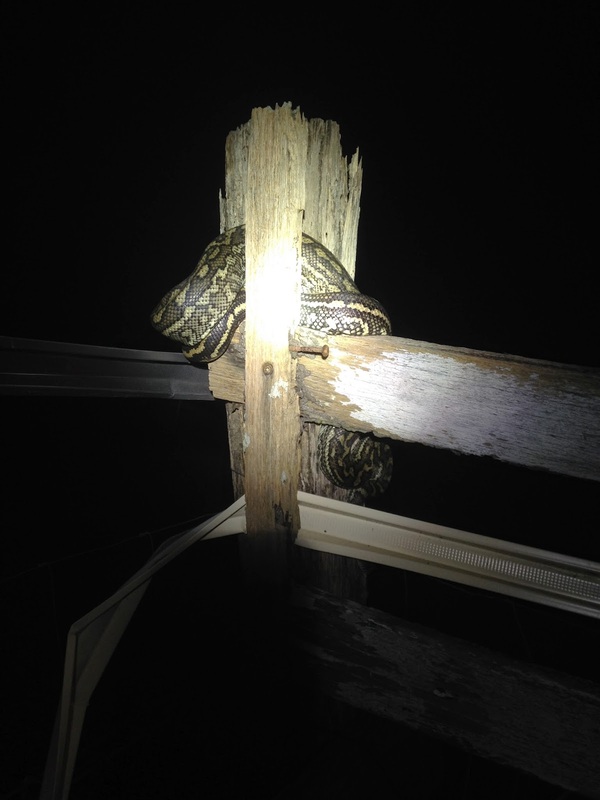 Frequently seen in the Silky Oak and on the deck is a small Carpet Python. 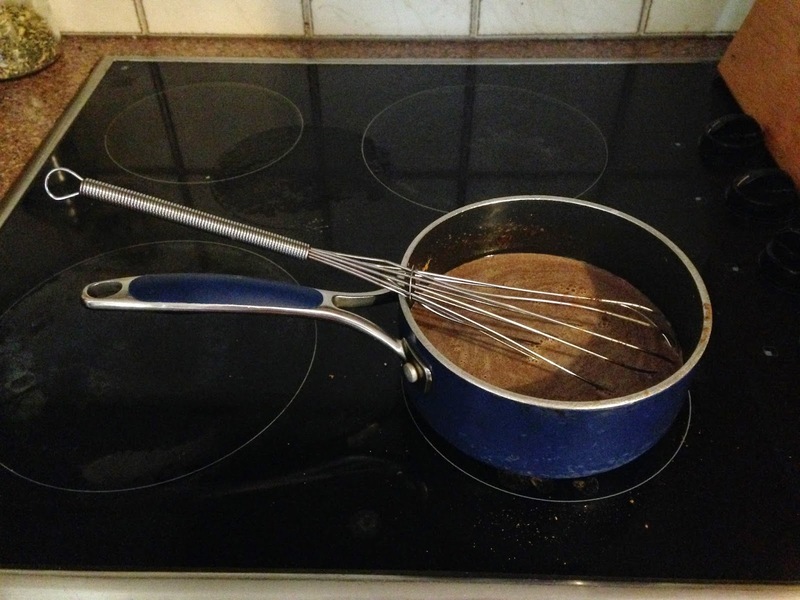 Basically combine the above in a saucepan over the stove until just below boiling point and serve. 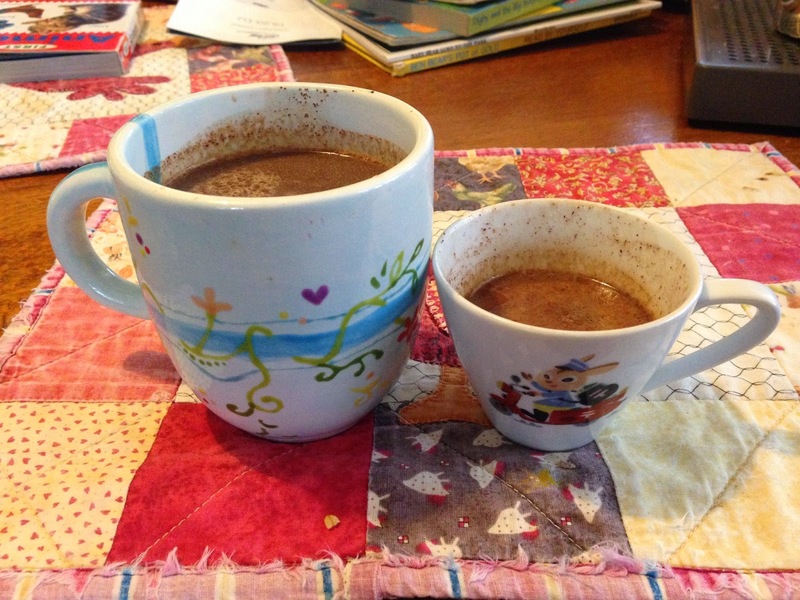 Not only is it delicious, but its much healthy AND cheaper than the commercial hot chocolate available. Yes it is slightly annoying having to cook it on the stove top, as opposed to 'instant' powder. But it only takes 5 minute, instead of 1 minute. And is totally worth it. Plus it got a huge tick of approval from Gigi, so win-win. 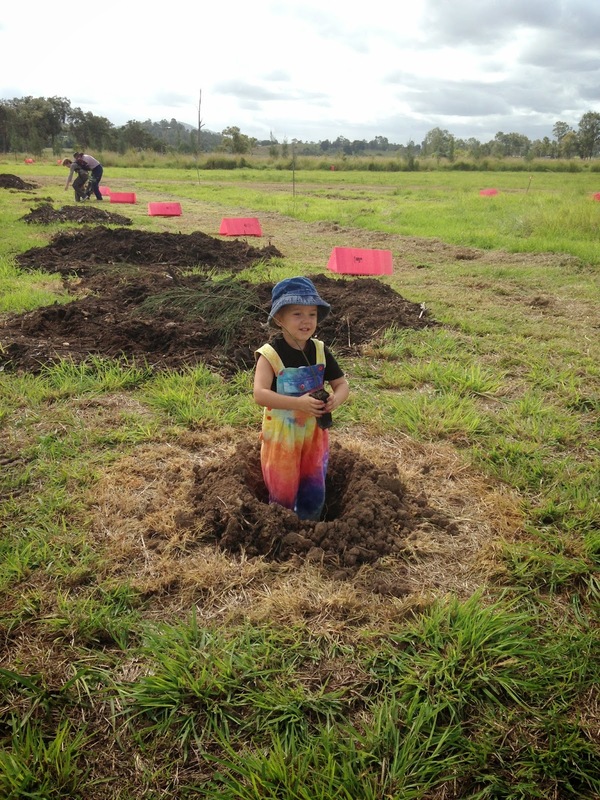 On the weekend- 9th-11th May, The Planting Festival was held at the Woodford Folk Festival site. 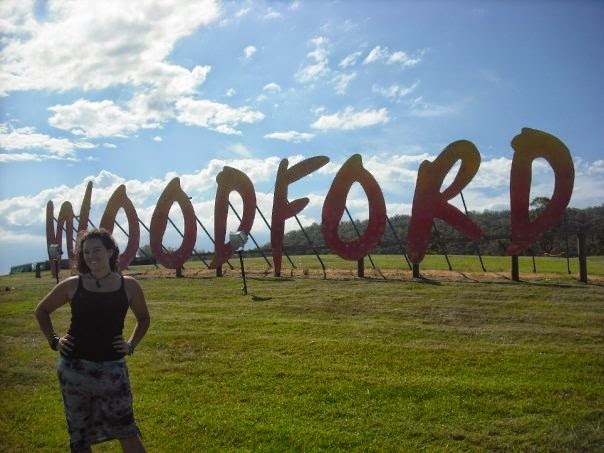 The Woodford Folk Festival is a six day festival in Woodford held over the Christmas- New Year Period. 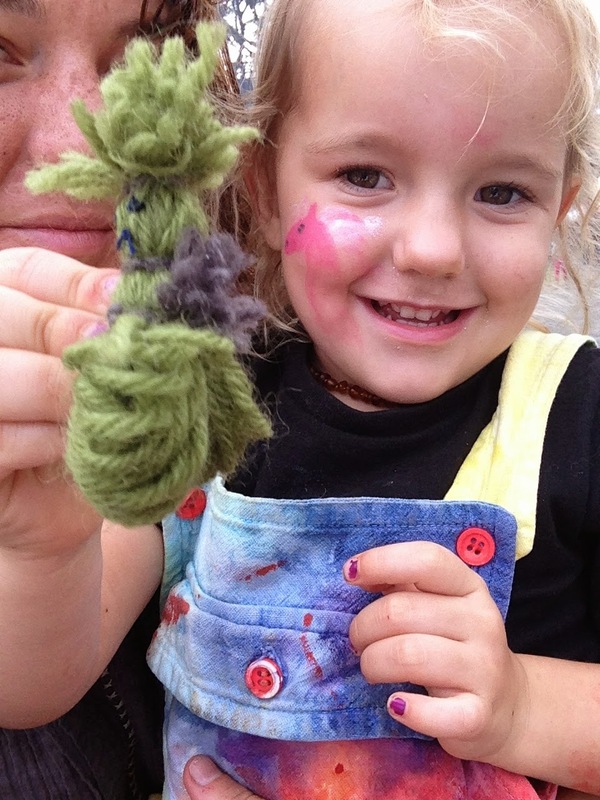 In my humble opinion, Woofodford Folk Fest is the best festival ever with an eclectic mix of music, crafts, activities, workshop, talks and people. The Festival site used to be a cattle farm, so from an environmental view, pretty degraded. Over that last twenty years, an army of volunteers have been planting native species, removing weeds and generally improving the site. This is where the Planting comes in. 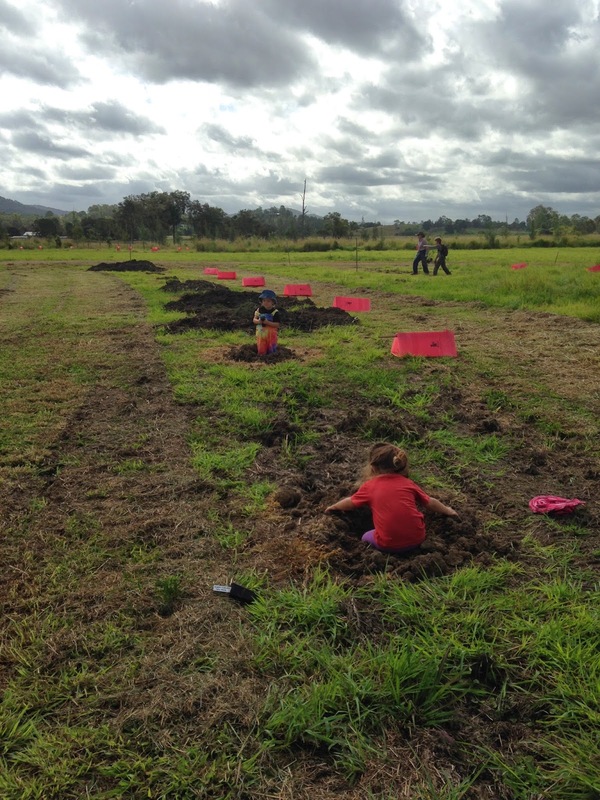 It started as a weekend of volunteers planting trees and weeding and has evolved into a small festival with music and gardening/composting/ weaving workshops. I volunteered to help out at the festival in return for a ticket. 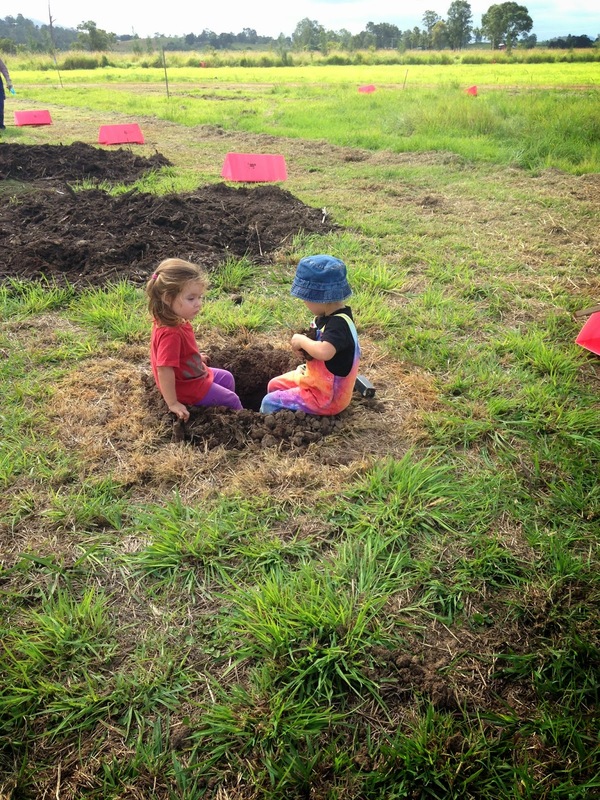 Over the Saturday and the Sunday there are two large group planting activities. 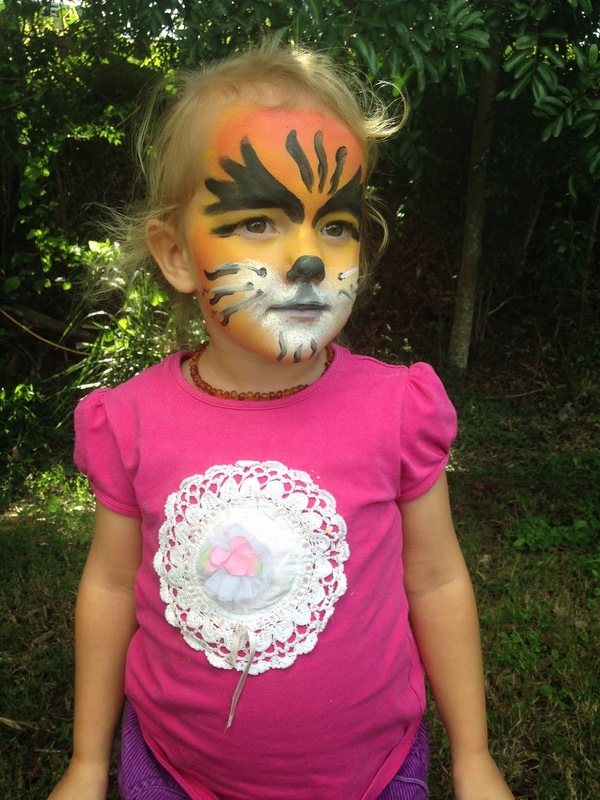 Gigi and I participated in the first of these on Saturday, as it was family friendly. Needless to say, Gigi loved it. 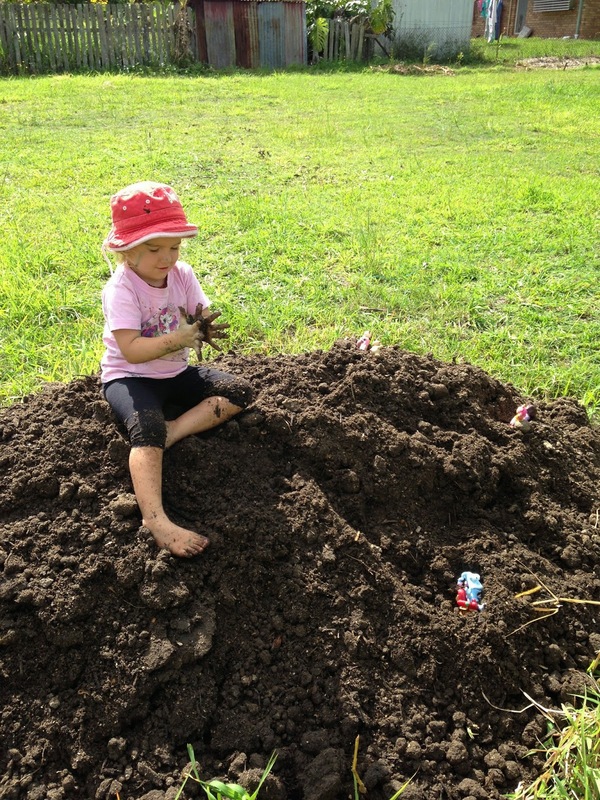 She loves getting dirty, mulching and planting trees. Best of all, there was another little girl the same age to play with. Very quickly the two girls became partners in crime, kicked off their shoes and ran around like crazy. One of the beautiful things about childhood is the ability to instantly connect with other kids. 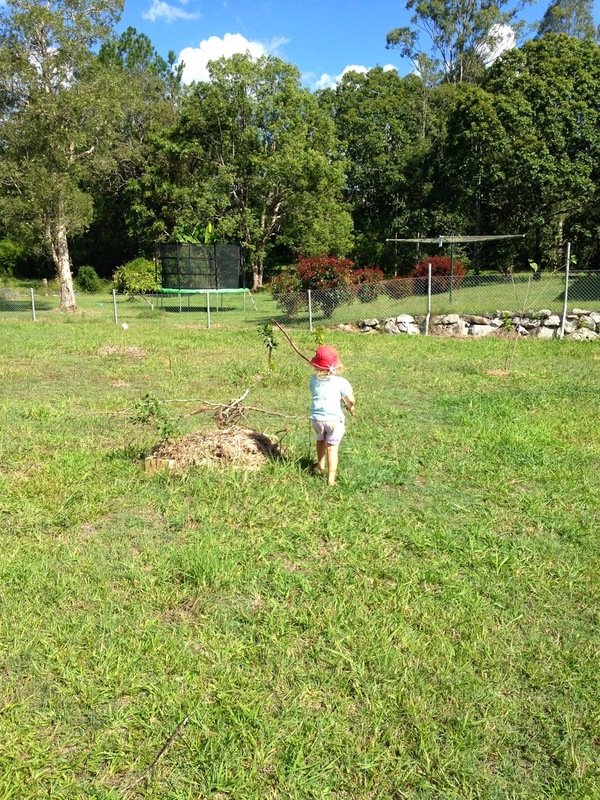 Everywhere at The Planting were groups of kids running around playing- with sticks, with seedpods, in the creek, in a tree. 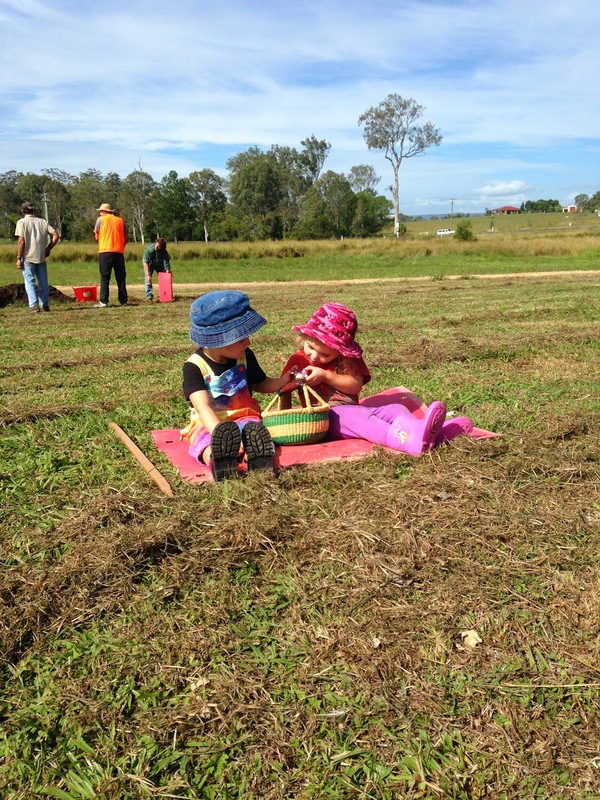 It was fantastic to see the kids playing outside with objects as toys and their imaginations. Not one 'smart device' was to be seen. It was just lovely. As for me, I also had a great time. I went to several workshops on working with bamboo and also a weaving workshop. I'm feeling very inspired and will be posting all of my projects as I attempt them. Our day in the City. My brother has been in hospital with the chicken pox this week. Apparently a non-serious disease in kids is really serious in adults. He's on the mend now, but is in a lot of pain and is pretty scabby. To help him and my sister-in-law out, my parents and I looked after his two girls for a few days. I decided it'd be a good opportunity to take his eldest daughter, Lil and Gigi into the city for the day. We caught the train into the city, which the girls loved. Lil had never been on a train before and Gigi absolutely loves trains. When we arrived in the city, the weather was overcast with rain showers, so I took the girls over to Southbank to visit the museum. When I was younger, my Nana would take us to lots of exciting place during the school holidays. One of my favourites was the Queensland Museum. Unfortunately at 4 and 3, Lil and Gigi are a bit too young for the Museum. We wandered around for about an hour, but the girls lost interest pretty quickly. We had a quick afternoon tea and then headed over to the Gallery of Modern Art (GoMA) because I'd heard they had a pretty good kids area. There are two kids areas, one on the ground floor and one on the lower ground floor. Both were absolutely brilliant. 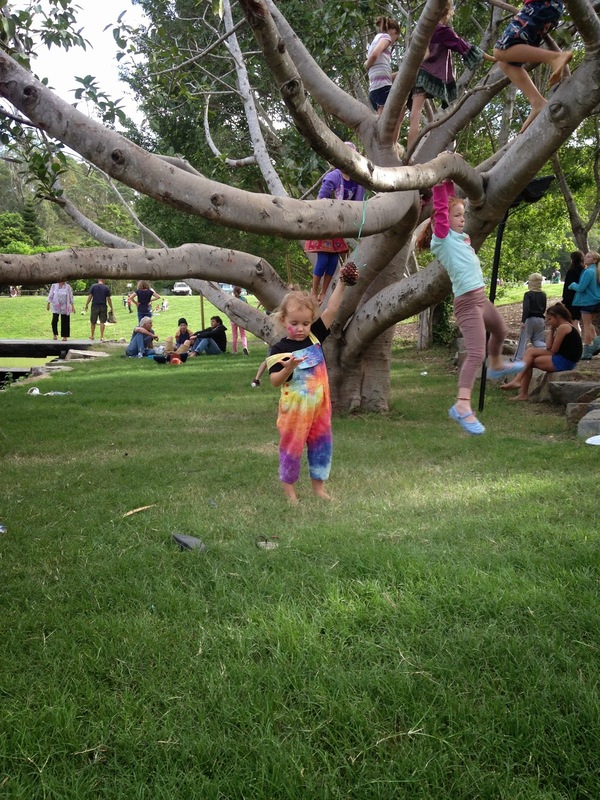 The first area had a construction-type activity where kids could choose to build either an animal, a boat or a tree out of cardboard. 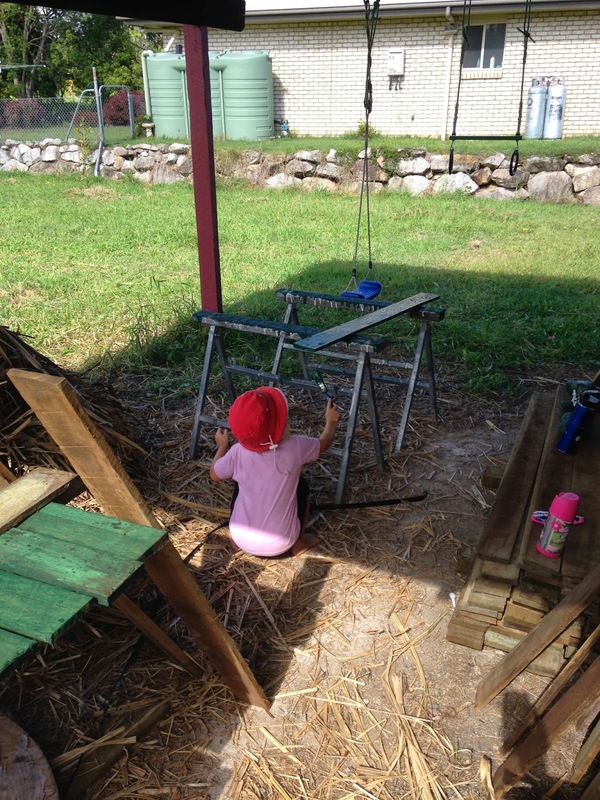 Both of the girls wanted to build a boat, so we collected the materials and got to it. The girls coloured in their cardboard beautifully, then popped out the cardboard pieces and I helped to sticky tape the boats together. They LOVED their boats, and played with them constantly for the afternoon. Next we headed downstairs to the 'Kalidescope' themed kids activity room. It was so great, I didn't even have time to snap any pictures. The girls made a cardboard coloured mosaic, which was placed on a spinning machine and spun to show how colours melded together. 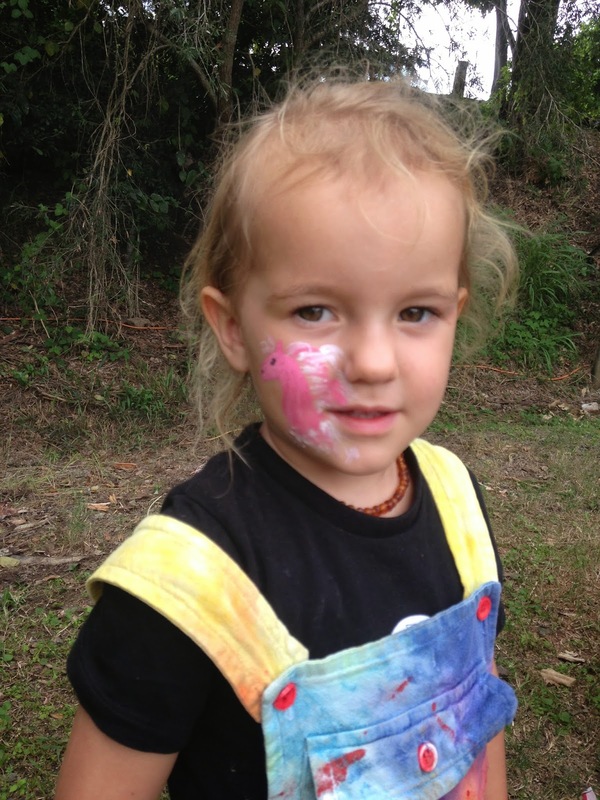 Next we coloured in some white linen material using colours and various stencils to make headbands. The gallery kept the girls busy for about 3 or 4 hours. They loved the hands on activities and I'm not ashamed to say I did too. I have my own headband from our little trip, and I made a cardboard tree! 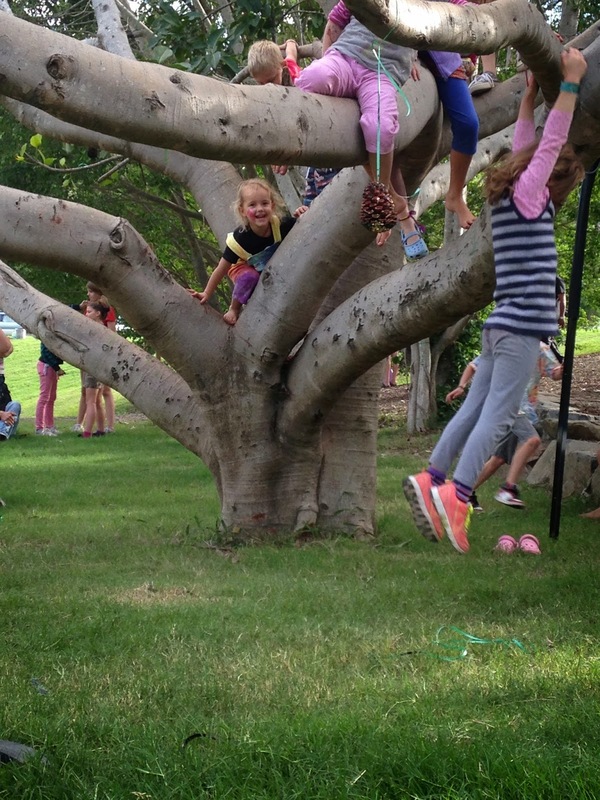 We went on a Friday and during the school term, which turned out to be a great time to visit. There was hardly anyone at the museum and we had the kids areas at the Gallery of Modern Art all to ourselves. I definitely recommend the GoMA as a rainy day activity, particularly during the week. I can imagine it would get very busy on the weekend.